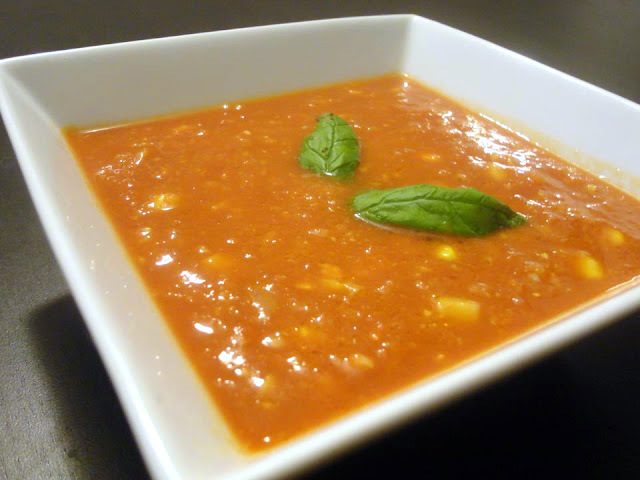 This soup, which takes advantage of fresh sweetcorn and basil can be served hot or cold. 1. Fry the onions in the olive oil to soften in a saucepan over medium to high heat until they just begin to brown. Add the garlic and gently fry for another for a minute, stirring constantly. 2. Pour in the tomatoes and cook, stirring occasionally, until they give up their juice. Cover and continue cooking about 5 minutes. 3. Add the water and corn to the soup and cook, about 5 minutes. 4. Season to taste with salt and pepper. Stir in the basil, mix well, remove the heat and serve.